On Saturday, Midlands Beer Garden turns into a “Pup-Up bar” with dogs and brews. Photo courtesy of Devils Backbone Brewing Company. In advance of the National’s opening day next week, the Willard InterContinental has chosen a baseball theme for its monthly History Happy Hour. Susan Reyburn, curator of the “Baseball Americana” exhibit at the Library of Congress, will take attendees through the complex history of the sport on Thursday from 6 to 8 PM. Veteran hotel bartender Jim Hewes will show guests how to make cocktails inspired by the game. Tickets ($54) include three cocktails and light snacks. Thursday is the spring equinox and beginning of Persian New Year (Norwuz). Celebrate at Mess Hall starting at 6:30 PM with a four-course Iranian dinner from Convivial’s Saied Azali, chef Keyvan Djavan, and Ben Alt of Reliable Tavern (tickets are $85 per person). 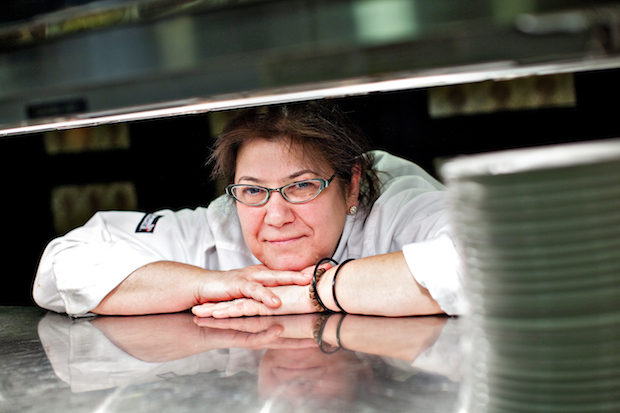 On Sunday at 1:30 PM, award-winning Iranian cookbook author Najmieh Batmanglij (nicknamed “the Julia Child of Persian cooking”) will serve a multi-course New Year feast at A La Lucia in Alexandria. Tickets are $165 per person. Mexican-themed Mission in Dupont celebrates five years on Thursday with a bunch of $5 deals from 7 PM to close, including $5 margaritas, quesadillas, Coronas, and El Jimador tequila shots. Artwork at the Art League’s Art on the Vine event. Photo courtesy of the Art League. 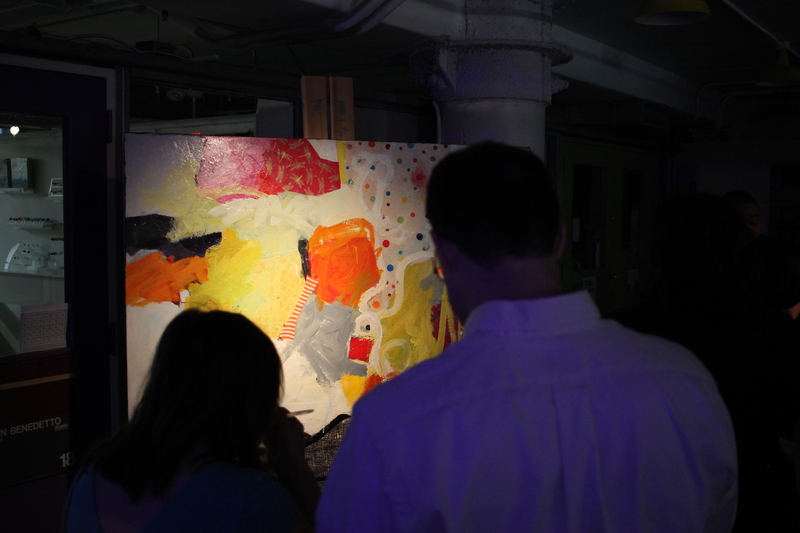 Education nonprofit Art League hosts Art on the Vine on Friday from 7 to 10 PM in Alexandria. Guests receive a complimentary wine glass for the lineup of global wines, a light buffet, and access to the fine art gallery at the Torpedo Factory Art Center ($55 per person). All proceeds benefit programs at the Art League. Saturday is National Puppy Day, and Midlands Beer Garden is going all out. Devils Backbone Brewing Company is hosting a “Pup-Up Bar” at the Park View spot where “pup-tenders” will deliver beers to thirsty two-legged patrons from 1 to 4 PM. Attendees will also get the chance to meet adoptable pets from City Dogs Rescue, which will receive a portion of the day’s proceeds. If you can’t make it, the Virginia brewery is still encouraging submissions to its Adventure Dogs photo contest. Wunder Garten’s CherryFest kicks off on Saturday. For two weeks the outdoor beer garden in NoMa will host a cherry blossom pop-up in partnership with Japanese beer company Kirin Ichiban. Patrons will find Japanese drinks, food from vendors like Tokyo in the City, dancing, and art classes. The festivities also include ticketed events like a $10 drinkable arts class on Sunday from 3t o 5 PM. On Saturday afternoon, Arlington’s New District Brewing Company celebrates Greek Independence Day with catered food from Our Mom Eugenia, traditional Greek dancers, live music, and more. Tickets are $20 and include a plate of food and your first beer. Union Kitchen’s Meet the Makers event. Photo courtesy of Union Kitchen. 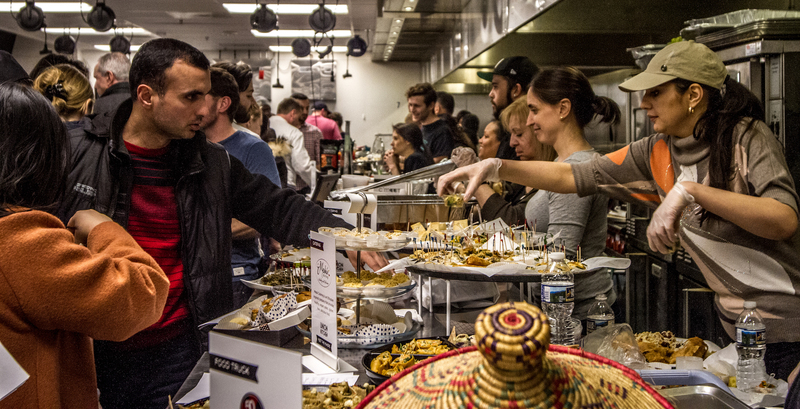 Sample local food and drink from DC-area entrepreneurs this Saturday from 4 to 6 PM at Ivy City’s Union Kitchen. Meet the Makers, a ticketed event, introduces guests to 50-plus producers like Snacklins, Swapples, Eat Pizza, Sip City, Sasya, M’Panadas and more. The $20 ticket (or $25 at the door) includes food and drink samples. On Sunday, DC’s 3 Stars Brewing Company hosts “The Gang’s All Here,” a collaborative party with beer from Mid-Atlantic producers like Barrier, Interboro, Other Half, Manor Hill, and more. Drop by between 1 and 6 PM for beer from 28 taps, DJs, food trucks, and giveaways. Tickets are $15 to $50. Ris Lacoste will provide treats for this weekend’s Coffee, Tea and Chocolate event. Photograph by Scott Suchman. Les Dames d’Escoffier hosts a Coffee, Tea and Chocolate even on Sunday from 1:30 to 4 PM at Ris near Foggy Bottom. Laurie Bell, the owner 0f Great Falls Tea Garden, Jodi Lehr, co-owner of Santa Lucia Coffee, and baker/cookbook author Nancy Baggett will guide guests through history lessons and tastings. The event is $50 for the public ($40 for Les Dames members). On Monday, U Street Music Hall hosts Speed Rack, a touring national competition for women bartenders. Female mixologists will go head-to-head in a round-robin style tournament of speed and skill from 6 to 10 PM. All proceeds from the ticket sales ($25 in advance, $30 at the door) go to breast cancer education, prevention, and research. If bottomless spritzes sound delicious and perfect for spring, head to All-Purpose Pizza in Shaw starting Monday for a free-flowing spritz happy hour (through Friday). Held at the bar from 5:30 to 7:30, patrons can get bottomless drinks for $19 including the O.G. Spritz (Prosecco and Aperitivo Select) the French Shandy (dry cider, lemon, and Bonal Aperitif), and the Portuguese Tonic with white port. The Nationals Homecoming Gala is this Tuesday on the Wharf. If you didn’t score tickets, you can still celebrate the home opener by stopping by the red carpet watch party from 5 to 7:30 PM at the Wharf’s Cantina Bambina. Enjoy live music, food, and possible appearances by Nats players ($30 per person). Look for full coverage of Nationals opening day festivities next week.